In the liner notes to the Revisited label's reissue of Klaus Schulze's second album Cyborg, Schulze himself summarily dismisses the term "kosmische musik," first coined by the legendary owner of the '70's German label Ohr, Rolf-Urich Kaiser. In fact, Schulze makes no effort to mask his obvious disdain for the term: "It makes me sick, even today… it reminds me of the cheap popular sci-fi novel series Perry Rhodan... so one could have been written that Cyborg is a kind of electronic dime novel." It's not so unreasonable for Schulze, throughout his nearly forty years as an electronic musician, to draw such conclusions regarding the general catch-all phrase coined by music writers astute and otherwise. He's been there from the beginning: engaging the post-psychedelic birth pangs of the '70's, shucking off the vestiges of what was euphemistically labeled 'krautrock,' weathering the corporate venalities that ushered in "new age," and unwittingly branded by a '90's generation of computer cowboys who've since dubbed him "the godfather of techno/ambient/spacemusic." So why is it that Schulze seems to maintain his status as a cult figure among aficionados, collectors and enthusiasts of the so-called Berlin School, and of electronic music in general? Why is he not held in the same esteem, except by insiders and colleagues, as his shared-era brethren Tangerine Dream and Kraftwerk, evidenced by a catalog of recordings that rival the former's in breadth and the latter's in style and substance? Why does Schulze remain a mythic, even mysterious, let alone nearly "unknown" (though, paradoxically, a casually referenced) figure within comparative journalistic discourse, at least in the U.S.? Why is it that a legion of marginal, copyist, even exploitative artists have grown entire cottage industries around his trademark sound, establishing an overwrought genre music that pays respect to its source without any tacit acknowledgement thereof? Perhaps there's a weird act of timing at play, a sudden, unexplained juxtaposition of the planets aligning in some grand cosmic (there's that word again) scheme but Revisited's massive, ongoing reissue program of virtually all of Schulze's back catalog this past year is cause for celebration. The ear is reacquainted with the Schulze oeuvre now by recordings that, via the astute care lavished on their remastering, erupt from the speakers with startlingly clear tonalities, and by packages aburst with exhaustive liner notes, photos, tactile and embossed cover art, and unreleased, extra tracks of sometimes gargantuan length (validating the CD format magnificently in this specious time of audio downloading exhaustion). Distributed worldwide, it is more telling to note that for the first time, Schulze's recordings are now findable, particularly in the U.S., and without the attendant high prices once mandated by imports. It could be argued that with the change in the music paradigm, thanks to the casual, disparaging manner in which many now consume, collect, distribute and archive recordings, that it's too much, too late. Well, it might have been the Bard who once said "bushwah!" which, roughly translated, means that there is no better time than the present to absorb the Schulze canon wholecloth, to now have recordings not just long-admired by the cognoscenti, but made easily available to the novice who might have heard the name whispered yet failed to make the necessary connection or put it within its rightful context. Those connective dysfunctions have, for decades past, kept Schulze from breaking out of Tangerine Dream's shadow and subsequent limelight. Despite both originating in the same timeframe, TD and Schulze marked out superficially similar, but ultimately divergent, territory. Enamored with and availing themselves of the technological breakthroughs occurring in electronic music production in the nascent '70's, obsessively accumulating vast banks of then state-of-the-art synthesizers, keyboard controllers and sundry other devices, and extolling a near-fetishistic zeal for where such technology might take them, TD and Schulze laid the groundwork for an entirely new aural lexicon, making what was first conceived as avant-garde simply garde, a type of synthetic sound design that was steadfastedly European. Regardless of the level of recording prolificness rarely achieved even in the contemporary underground CD-R domain, and untold hours performing in front of surprisingly large, appreciative audiences throughout the world (excepting the U.S., where word in the early 70s was slow to spread, and a place that Schulze, amazingly, has never played to this day), TD and Schulze ultimately wound up on different sides of the same coin. 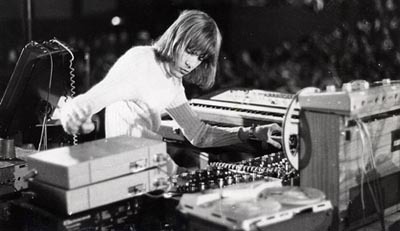 In deep love with the alchemical results borne of synthesizer and sequencer, allowing torrential, intricate rhythmic lattices of notes to spiral across vast alien landscapes wrenched from the artful bending of circuit and frequency, TD and Schulze shared approaches but realized different iconographies. As Hollywood beckoned the Dream to exchange their tangerine for tinsel, Schulze (though no stranger to the odd soundtrack himself) stayed a course that if anything mirrored that of the lone classical composer happy enough to labor intensely in private while honing his craft, experimenting, progressing, negating compromise and ceaselessly working. In a 1994 interview I conducted with Schulze, he spoke fondly of the genius of Mozart, of how his approach to electronic composition reflects the modes inherent in classical structures; he noted that "the setting up of my music has always been ‘classical' because of the (track) lengths, how the pieces build up themselves. But I don't feel limited by classical settings the way a symphony is." Nevertheless, unlike the more "pop" inclinations Tangerine Dream's music gradually leaned towards (and has markedly embraced in their first post-Hollywood phase of the mid-80s), Schulze's music possesses that distinctive "classical" air, one which has (mostly) sidestepped the attendant pomposity of the classical genre, for the very reason that Schulze has rarely allowed his arsenal of electronics to sound like their acoustic doppelgangers (though the auguring in of digital synthesis surely invited temptation). Rather, what lies at the core of Schulze's recorded history is that he never lets the listener forget, even when his synths mimic corporeal instrumentation, that his sounds are intentionally rendered by electronics, and designed to be experienced as such (though he can be forgiven the odd misstep, such as '94's forgettable Goes Classic, and the recently reissued 2000 set Ballett, which suffers from a similar malady but at least benefits from less obvious phrasing and a more variegated sonic palette). The fact is that while Tangerine Dream became less inspiring, Schulze never lost his dogmatic approach to synthesis, and whether every record rocked your world or not, it remains difficult to fault Schulze for denying himself the path of least resistance. Like the most complex symphonies, his music engulfs the senses, boasts numerous internal colors that morph, respirate and transmogrify themselves in a kaleidoscopic fashion, and, above all else, fascinates, even when it is at its most relentless. Though surely not the biggest reason for his wiles failing to set tongues wagging across the long span of years and continents, one of the unfortunate byproducts of Schulze's catalog, and why his anonymity in many circles remained, is that the "limitations" of his vernacular were exposed by a litany of synthesist wannabes who missed the point while working the hideous cliché long known as "the Berlin School." Setting aside the notion that there is nothing inherently wrong in trucking in genre music, those who merely aped the Schulze sequencer imperative were arguably slumming within said genre, unable to expound on the form, operating under the maxim that repetition itself provided the keys to the kingdom. From out of a mountain of non-recyclable plastic has come a unfortunate and voluminous barrage of synth-sequencer music that has lugubriously quoted the Schulze legacy as it simultaneously tarnishes it. Ironically, Schulze has become somewhat "eclipsed" (in fundamentalism, not invention) by lesser talents whose grafting on to the electronica sub-movements of the aughts (techno, trance, ambient, etc.) have held them in better stead. Schulze's attempts to erect conductivity in similar areas (even with his later Wahnfried projects and the original Are You Sequenced? 's companion remix CD) have been less successful, despite gigs such as producing second-tier synth-poppers Alphaville and their The Breathtaking Blue album. Far more integrated into the modern diaspora is the Dark Side of the Moog series Schulze has done in collaboration with the erstwhile Pete Namlook, spread out over ten volumes on Namlook's Fax label (some of which include another journeyman musician, Bill Laswell), and though not entirely successful (there's a paucity and/or stretching out of ideas here and there), all possess moments of sparkling ingenuity amid the occasional longueurs. Keeping this mind, listening to the Schulze catalog in the 21st century, does anything hackneyed rear its ugly head? If one dispenses with the countless series of Schulze clones that have come and gone (or who annoyingly proliferate), or if one tenders the man's sounds with their ears for the first time, there are definitely more riches than rags awaiting discovery, and a clearer picture develops along the progression of his work that details where his muse has led him over almost four decades time. The charmingly primitive electronic organ and orchestral processing that makes up his stark debut Irrlicht, though no doubt redolent of its date and place (the evolution of instrumentation and its attendant technology is a potent dating system, especially in the realm of electronic music), manages to conjure levels of awe, for it still sounds like nothing else; majestic, beatless and id-altering in the truest sense of psychedelia, Schulze is right in appraising this work as resembling musique concréte more than the traditional "spacemusic" he would soon become tethered to. That very spacemusic would emerge full-force on Cyborg, and proceed apace through Blackdance, Picture Music, and Timewind (all three of which sport some of the finest faux-Dali covers ever), culminating in the classic sequencer matrices of Moondawn. Stunning and genre-defining as these records are, Schulze's subsequent work was already making tentative moves away from the tyranny of the sequencer grid that rubberstamped his early material, and, with the advent of digital synthesis (and the baby steps of MIDI) came whole new worlds to conquer. Yet, the infinite realms of digitalia proved a mixed blessing. Schulze pursued the virtually infinite choices of sounds now at his disposal, but the familiar "symphonic" approach long undertaken in the past has in retrospect contributed to work that seems more enchanted with the tool than the trade. This is not to diminish the exuberance Schulze has demonstrated with those early digital recordings. At the time, Dig It might have been too easily dismissed, maligned simply by dearth of the fact that it sounded so different when compared to the dense whitewash of Mirage or the cauterized, wind-blasted patina that surfaced on Dune (still a personal favorite, and one of Schulze's most underrated records). Looking back now, Dig It was too far ahead of its time; history and musical trends have since painted its abstract collages and puzzle-box rhythms with a less-harsh brush. Continuing to elaborate on these directions as the '80's progressed, Schulze reached something of a critical mass (artistic crossroads?) in the '90's. Here is where the catalog alternates between engrossing and maddening. Works such as Miditerranean Pads suffer from lack of substantial ideation; his sonic choices are always captivating and don't jettison their originality, but compositionally there's a sense of his devices being left on autopilot—vivid sounds aren't always a MIDI-splendored thing. However, it is in other documents from this era—the introduction of sampling on Beyond Recall, the two superb live albums that comprise Royal Festival Hall, and the equally mesmerizing Dome Event—that herald where Schulze would take his music in the next century. Anyone thinking his best work was twenty years behind him must have been pleasingly shocked when exposed to these recordings; trading the dry air of the studio temporarily for the manifest rush of live performance seemed to instill a burst of creativity in him that continues unabated to this day. Nevertheless, Schulze still remains something of an enigma. His obsession with the metaphors innate to our planet's one natural satellite has not lost its attraction to him: last year's Moonlake doesn't echo Moondawn in anything other than title. Yet, it is the sound of Schulze using all the means at his technological fingertips to work out new ideas within his system. The 30-minute "Playmate in Paradise" is contradictory in its design, a "culmination" yet also an extension of the sampling techniques he has mastered to galvanizing effect over the last 10+ years. Electronic music's appeal for most is the unearthing of new sounds, of textures heretofore unheard of by the human ear, and for those sounds to be arranged in compelling ways. Not adverse to the concepts of melody when it suits him, Schulze manages to inveigh during the half-hour of this phantasmic epic noises of such tantalizing natures that they beggar description. It's all utterly contemporary and pointedly futuristic, the kind of "sci-fi music" that Schulze has been making since the beginning, that conveys more attainable utopias, and more latent mystery, than music simply labeled "kosmische." With his catalog now in print for the foreseeable future, if anything Schulze's work may find itself finally stripped of its well-worn mystery. In the mid-'90's, he expressed concern as to electronic music's future, that a genre sublimated into the bowels of rock or knotted on the fringes of experimentalism would take years to be recognized. The subsequent "legitimization" of electronica raised his hope and fears; would emerging artists signal in the future, or be mere flashes in the proverbial pan? Comforting to know that in this age of software pushers and lap(top)dogs, Schulze still fervently remains the former. Track the details of Schulze discography through his official website and see our Klaus Schulze interview. Darren Bergstein is editor & publisher of e/i Magazine, the foremost source for musics electronic & otherwise. Once a print periodical, the magazine can now be found online at: www.ei-mag.com.